Once you have completed your IELTS preparation lessons and feel you are at a good enough level to reach your target IELTS score for UK university entry, you will need to take the IELTS test. A large number of students go into the test without really understanding what they need to do though, and in today’s article we will be focussing on the IELTS exam and its structure. The Academic IELTS test is divided into four sections and each candidate is given a score out of 9.0 for each section, and an overall score is taken from the average of these four scores. 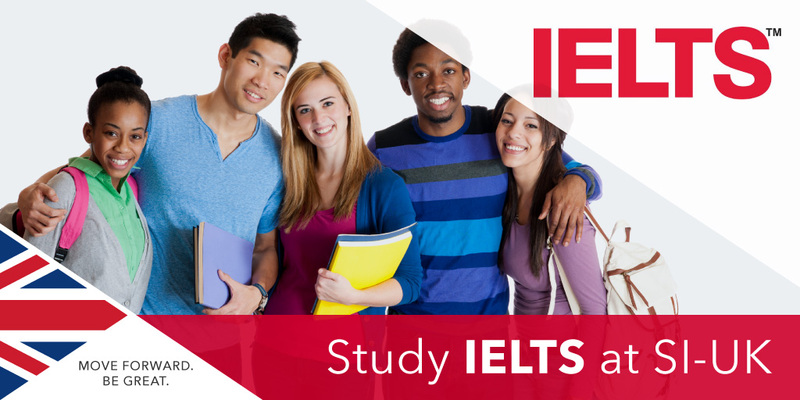 Learn more about each part of the IELTS exam below and if you need to improve your English before signing up for the IELTS exam, SI-UK offer low cost IELTS preparation lessons in central London with no registration fees and all your materials provided. Enquire today to learn more. The listening test is divided into four sections, and these sections are always in the same order. Each section is played once, and is not repeated. You are given ten minutes to transfer your answers to the answer sheet. A conversation between two speakers on a non-academic topic. This could be two friends planning a holiday, a customer trying to choose what product to buy, or somebody trying to arrange accommodation. One person will speak on a non-academic topic. This could be somebody explaining the schedule of a music festival, or somebody describing upcoming holiday activities. Up to four people discuss an academic topic. This is often a group of students discussing a project with each other, a student discussing a project with his/her tutor, or a seminar. This section is very similar to a lecture. A single speaker gives information about an academic topic. There are three reading passages in the Academic IELTS test and each passage is taken from a newspaper, a magazine, a journal, or a book. These sources are not written for a specialist, or expert audience. The subjects are designed to be interesting, or of use to a student entering an undergraduate or postgraduate course, or for someone who is seeking a professional qualification. At least one text will contain a logical argument, whilst another may contain visual material; a graph, diagram or illustration, for example. These passages may total 2000-2750 words in the academic test. Candidates are not given extra time to enter their answers onto the answer sheet. Candidates are required to write two essays in one hour. The part one section is worth 33% of the overall writing score. Therefore students should spend around 20 minutes on this section. Give solutions to a problem by suggesting measures, or actions, that could be taken. A part 2 essay will carry 66% of the overall writing score. Students are advised to spend around 40 minutes on this section. The speaking test takes just under 15 minutes, has three sections and is a one-to-one conversation with an examiner. The examiner introduces him/herself and asks the candidate about familiar topics like family, hometown, job, study and interests. The examiner gives the candidate a card, which contains a topic and some prompts. The student is given one minute to make notes, and is then allowed to speak on this topic for up to two minutes. The examiner then asks one or two extra questions. The examiner asks the candidate questions related to the topic given in the second section. These questions are more abstract and general, usually relating to society as a whole, rather than to the candidate. Understanding the requirements of the test and the types of question you may encounter is essential for maximising your score. Here at SI-UK we will try to provide you with strategies that help you to meet your IELTS requirements with our low cost IELTS preparation lessons. Get in touch today to learn more.